This article tries to solve iPhone 6/6 Plus, iPhone 6s/6s Plus and iPhone 5/5s data lost issue such as Text Messages, SMS, Contacts, Emails, Voice Memo, Photos, Video, Music, App, Camecal Roll, Call history, Calendar lost especially Text Messages, SMS, Contacts, Emails disappearing issue after iOS 10 update. No matter you have iTunes/iCloud backup or not, this solution may help you recover your lost data. For those who already tried every method to recover the lost files, the solution in this article is totally worth a try. 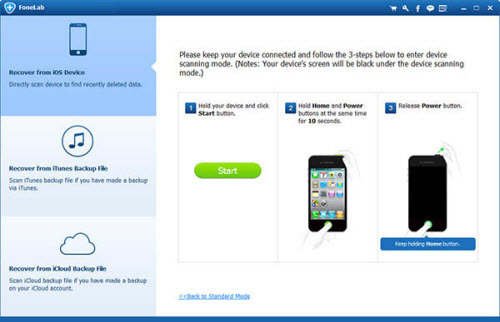 Connect your iPhone 6(s)/6(s) Plus or iPhone 5/5s with your computer with data cable, and then launch UFUWare iOS Recovery. The interface is as below. Note: If you only want to restore a few of them, please check box “Uncheck all” to unselect all the files, then selectively to mark what you want and click “recover” to save them on your Mac. 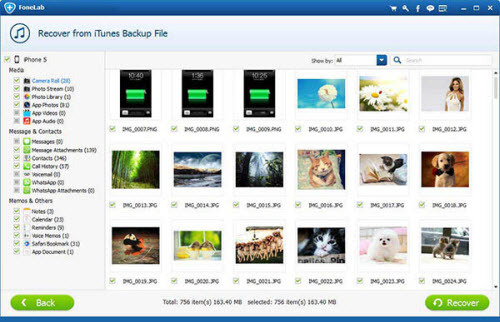 To avoid losing your iPhone files, immediate backup is very important and useful. Every time when you produce files with your iPhone 6(s)/6(s) Plus or iPhone 5/5s, do remember to backup them on your computer first. Click on the category name and view the contents under that category. Select the files you want to retrieve. Then click on “Recover” button to save them on your computer. Install and run iPhone Data Recovery on your computer, Choose “Recover from iTunes Backup” mode, then select the latest iPhone backup file, click “Start to Scan”. After the scanning finished, you are allowed to preview all lost data in the scan result. Just click the categories on the top side one by one. Selectively mark which files you want to recover, then click “Recover” to quickly restore and save them on your PC. 1. If you only want to get deleted files back, please check box “Only display deleted items” to list deleted files only. It can help you save your time and you can easily restore the deleted files. 2. If the “Only display deleted items” option is grayed out, it means that you can only backup existing files in that section. Nothing can be recovered there. 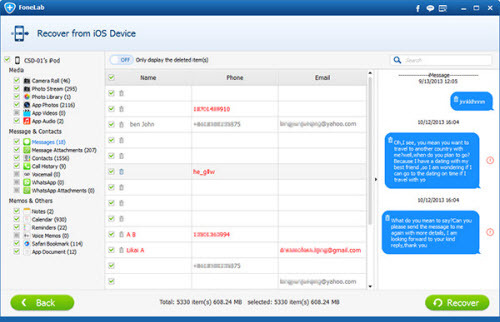 Choose “Recover from iCloud Backup File” after launching the Data Recovery for iPhone. Then sign in your Apple ID. 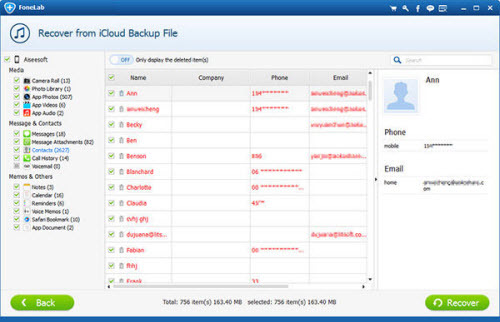 You’ll see the program showing all iCloud backup files in your account in a list. Choose the one you want to extract to download it. After that, you can directly scan to extract it there. When the scan completed, you can check the lost files in the categories of Text Messages, SMS, Contacts, Emails, Photos, Video, etc. Tick them and click on the Recover button to save them on your computer with one click.